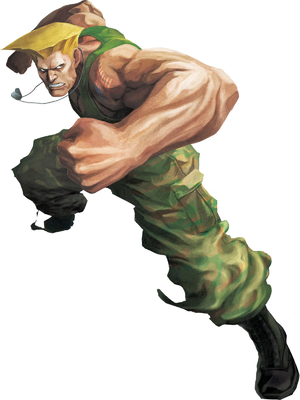 Guile's official artwork from Street Fighter X Tekken. Guile (ガイル, Guile) is a character from the Street Fighter series. He appears as an Assist Trophy in Super Smash Bros. Ultimate. Guile is one of the original eight playable characters from Street Fighter II: The World Warrior. He would go on to appear in every iteration of Street Fighter II, as well as the home release versions of Street Fighter Alpha 3, all incarnations of Street Fighter IV, as part of the first wave of DLC for Street Fighter V and in several crossover games. Guile hails from the United States of America, and is a major in the United States Air Force. Guile learned to fight from his best friend Charlie Nash, who taught him moves such as the Flash Kick and the Sonic Boom. But because Guile has less focus and greater anger than Charlie, he is less effective at using these moves; his Flash Kick hits only once and is performed with a conventional backflip as opposed to Charlie's two-hit reverse backflip, and he requires both arms to use a Sonic Boom, whereas Charlie only needs one. When Charlie went missing investigating the mysterious Shadaloo cartel, Guile swore to find his friend and bring him home. His search brought him into the path of Interpol agent Chun-Li who was also investigating a disappearance: that of her father. The two eventually discovered that Charlie had been kidnapped and brainwashed by Shadaloo's dictator M. Bison. Charlie broke free of his programming and rescued Guile and Chun-Li, seemingly at the cost of his own life. Guile swore vengeance on Bison and entered the second Street Fighter tournament to this end. Upon meeting Bison however, Guile was stopped by the arrival of his wife and daughter, who persuaded him to spare Bison and abandon revenge. For all his taunts of "Go home and be a family man!" Guile did just that. It was not to last, as he was not convinced that Charlie had perished. Going AWOL, Guile set out to prove once and for all whether Charlie was alive. He soon found his friend alive after being revived and stitched together by the Secret Society in Street Fighter V's Story Mode, giving him a final farewell when Charlie sacrificed himself to stop M. Bison. Guile is the second playable character to hail from the United States, the first being Ken. They are actually related by marriage. Ken's wife Eliza is the sister of Julia, Guile's wife, making the two brothers-in-law. Guile's behavior as an Assist Trophy is a reference to the infamous tactic of 'down-backing', where the Guile player constantly holds down and away from the opponent, charging up both his Sonic Boom projectile and Flash Kick anti-air while blocking. This defensive style of play is notorious among lower-level players that attempt to jump over a Sonic Boom only to get hit by Flash Kick immediately afterwards. Hitting Little Mac with a Flash Kick on Rainbow Cruise. Guile appears as an Assist Trophy. He mostly remains on the defensive, blocking attacks, although if a character tries to approach him from above, they will be attacked by Guile's signature Flash Kick. If no opponents come near him, he will repeatedly fire his signature Sonic Boom shots. He may also jump and, if an opponent is near while doing so, use a weak aerial kick. 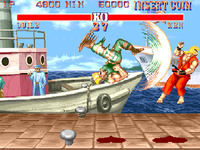 Like Ryu and Ken, the hits from his attacks emit the original hitsounds from Street Fighter II. His fighting style may be a playful jab at the playstyle of Guile players in the Street Fighter games, who are known for simply crouching in the corner of the stage, blocking any projectiles that come their way and using Flash Kick on those who get close while also using Sonic Boom on opponents who simply try to run their patience out by stalling in the same way. Guile's voice lines are recycled from Street Fighter IV. One of Guile's screenshot where he shoots Sonic Boom at Pikachu references Lt. Surge, a character from Pokémon series who is known for his Pokémon's usage of Sonic Boom. In Pokémon HeartGold and SoulSilver Versions, his attire looks similar to Guile. Guile posing on Suzaku Castle. Guile crouching next to Isabelle's "do not enter" sign produced by her up smash on Skyloft. Guile using Sonic Boom on Pikachu on Moray Towers. This page was last edited on April 12, 2019, at 17:10.